How Customer Value and Equity Covers the Measurement of ALL customer facing activity – marketing, PR, sales, customer service, community relations, etc. 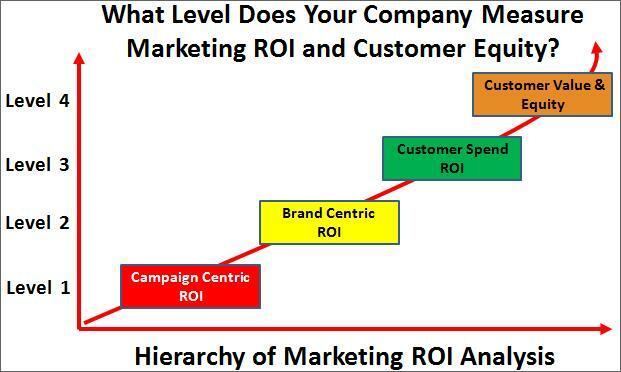 The following chart depicts the capability levels for measuring market ROI and customer value. 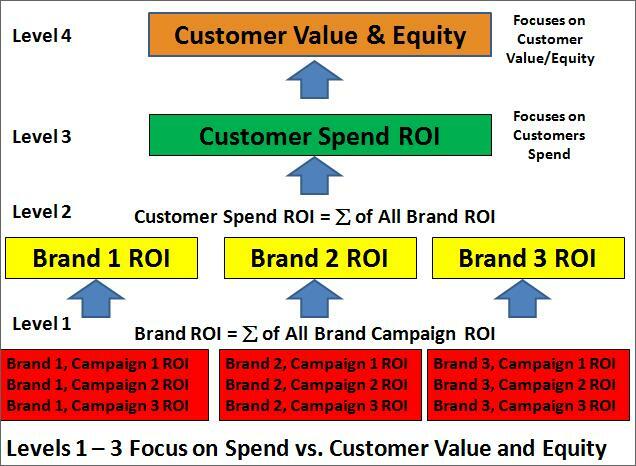 Level 3: Customer Spend ROI is the sum of all brand and all brand campaign ROI at a customer level. 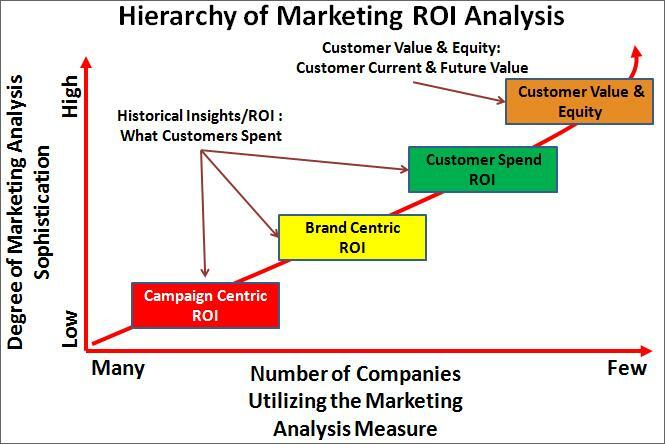 The following chart defines the first three levels of marketing ROI and points out the pros and cons for utilizing each method. The downfall for all three methods, as indicated at the bottom of the chart, is that they rely on historical spend vs. forward looking measures as are found in Level 4 – Customer Value and Equity Measures. 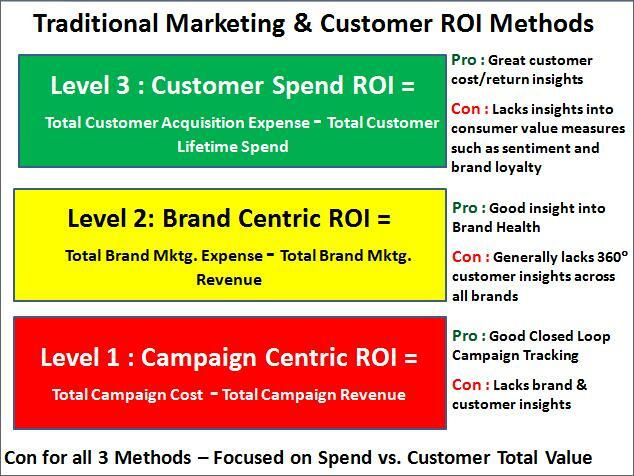 The following chart depicts the calculations for determining campaign level and brand level ROI that, if done correctly, should roll up to a customer level (Level 3 – Customer Spend ROI). The detailed definition of the highest level (Level 4 – Customer Value & Equity) is covered just below in this blog. 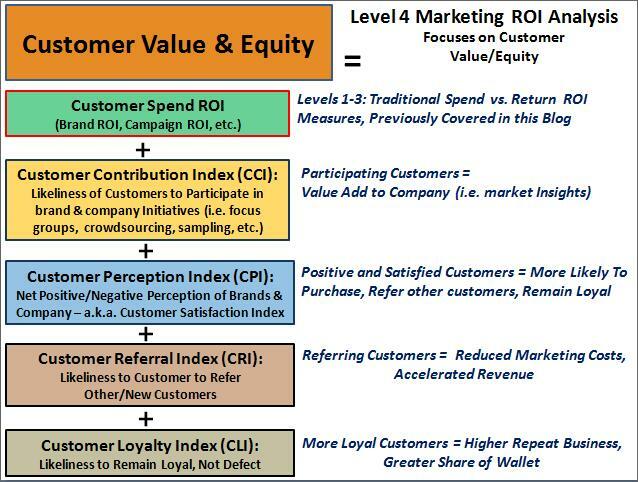 The following chart defines the components of Level 4 ROI analysis – “Customer Value and Equity”. This level includes the roll-up for Customer Spend ROI, but also includes insights that predict customer future behavior as well as defining how valuable the customer is to the company beyond what they spend. For example, a customer who is referring 2-3 customers to the company per week, participating in customer focus groups is a far more valuable customer than another customer with equal spend with your company. Similar to company stock value, the measurement of customer value and equity is a far more robust way to measure the value of the customer base, how likely they are to remain a loyal customer, etc. Customer Value & Equity Calculations, as shown below includes several different indices such as Customer Contribution Index (CCI), Customer Perception Index (CPI), Customer Referral Index (CRI) and Customer Loyalty Index (CLI). These indices help determine the overall health of the customer base vs. merely customer spend as is associated with levels 1-3 (spend focused). Customer Value and equity calculations take into account the level 1-3 spend ROI measures, but utilizes a balanced scorecard approach in that the indices above are weighted against the spend vs. ROI measures. For example, if Brand A has a high ROI but also has a bunch of irate customers unwilling to partner and participate in brand activities, then this is indicative of a brand that, while doing well now, will experience a great deal of future customer churn, negative social comments, brand tarnishing, etc. 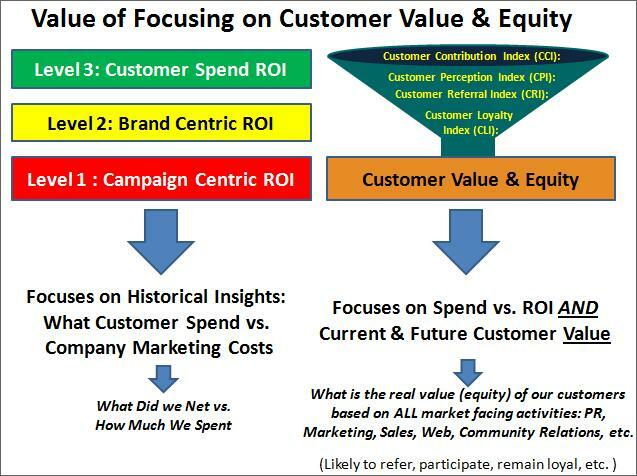 The following chart further defines the difference between focusing on spend ROI analysis vs. focusing on customer value and equity. 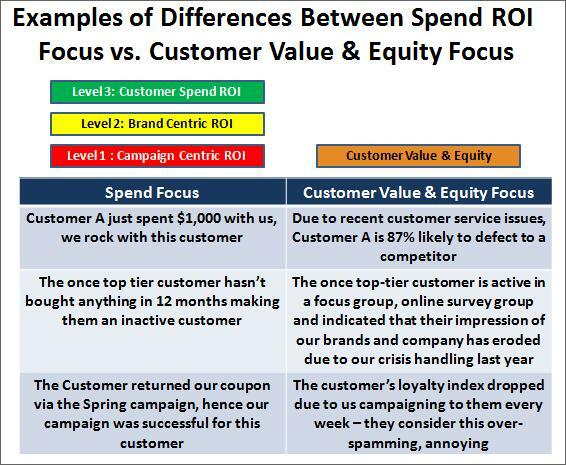 The last chart provides some real examples of the difference between focusing on spend ROI analysis vs. focusing on customer value and equity. The bottom line here is that if you are focusing on Level 1-3 ROI calculations, you have a short-term and myopic view of the health and value of your customer base and are missing the strategic and longer-term insights that enable you to determine customer, company and brand future value and earnings. Any company thinking about acquiring another should perform this robust customer diagnostic to determine if they are inheriting a group of angry/upset customers that will defect after a merger or a set of extremely valuable customers with positive customer equity who will take the stock value of the merged company to the stratosphere. Contact me to find out how to move past traditional marketing ROI measurement and how to evolve into developing more robust customer value and equity insights for your company.